As the first season approached, elements of the modern game began to take shape. Despite its original qualms about the formation of the League, The Cricket and Football Field periodical reported on 11 August 1888 that “the public are getting a little anxious to spend their Saturday afternoons on the football field”. With the advent of professionalism, boosted by the guaranteed income of regular league fixtures, finances became a major consideration – not least the matter of players’ wages; the same paper noted that FA Cup winner “Bayliss [of WBA] was seeking more money”. 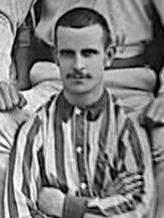 Everton dipped into the transfer market to sign Nick Ross from Preston, and made him one of the League’s highest-paid players at £10 per week. To cater for the larger crowds expected for league competition, Everton, playing at Anfield, sought to install a new stand and boost capacity to 12,000. The Liverpool Mercury reported further expenditure to prepare the Anfield pitch: “a complete transformation has been effected. Instead of a small Sahara-like desert, the field of play is covered with grass of refreshing green-ness”. 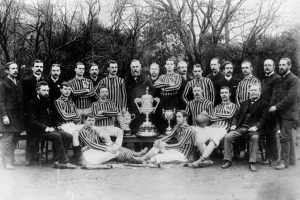 The game in 1888 still retained strong aspects of its era; the season’s start in September was partly determined by the fact that several clubs played at grounds shared with cricket (including Notts County at Trent Bridge), which took precedence. Saturday was the only practical day for fixtures, due to the 5 ½-day working week and the sanctity of Sundays; setting the kick-off at 3 p.m. allowed workers to finish their half-day shift and travel, often on foot, to the grounds. In winter, the starting time meant that both the half-time interval and sometimes even the game itself would have to be curtailed if it were to finish before darkness set in. It would take nearly another 70 years for a Football League fixture to be played under floodlights but, for all television’s influence, 3 o’clock on a Saturday afternoon remains the preferred hour for an English football match to start.